This October, the men of Delta Chi were busy with a successful Homecoming week, Dad's weekend, and other philanthropy events. On the weekend of October 1st, the brothers kicked off a great weekend with their dads. It started by having a father/son golf tournament at Eagle Bend early Saturday morning. Later, Chef Ryan grilled out for the chapter while the guys could enjoy some fun games on the front lawn. The guys capped off their night by celebrating the start of basketball season at the annual Late Night in the Phog. After Fall Break, the Annual Kimball Scholarship Meeting took place on October 15th. The associate members gathered in the living room to watch the brothers who won the scholarship accept their awards at this ceremony. During the week of October 17th, the men of Delta Chi were paired with Kappa Alpha Theta and the men of Zeta Beta Tau as their homecoming partners. The week was spent preparing the homecoming float, and pomping with both houses. All three houses participated in Jayhawk Jingles, a performance-based competition that takes place during this week. Our homecoming chalk mural was presented with the rest of the Greek murals on Wescoe Beach. The annual parade of floats on Massachusetts Street on Friday night ended a successful Homecoming week. 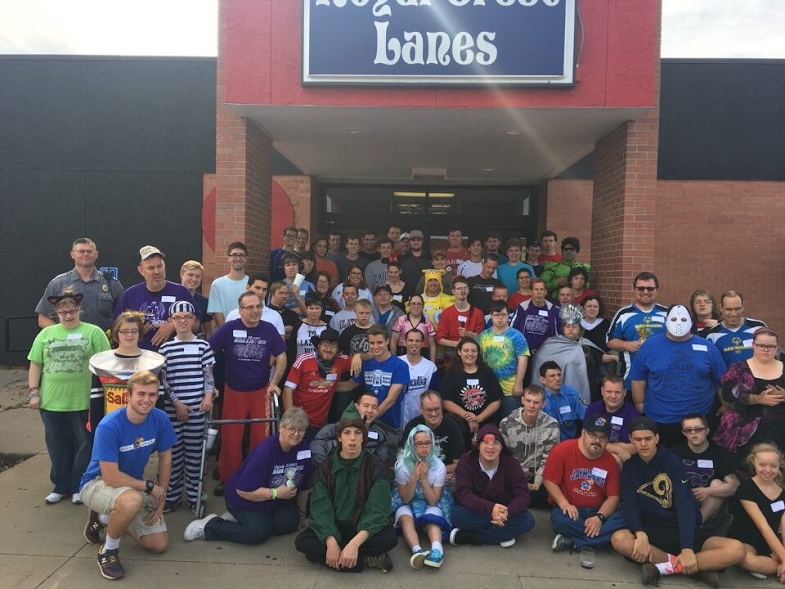 The men ended the month with a community service event at Royal Crest Lanes helping out with the Douglas County Special Olympics. They helped the participants during their games. Thank you to our community service chair, Preston Montegomery, for organizing this event!